Bass Arthur Woodley is no stranger to Seattle Opera—particularly this season. 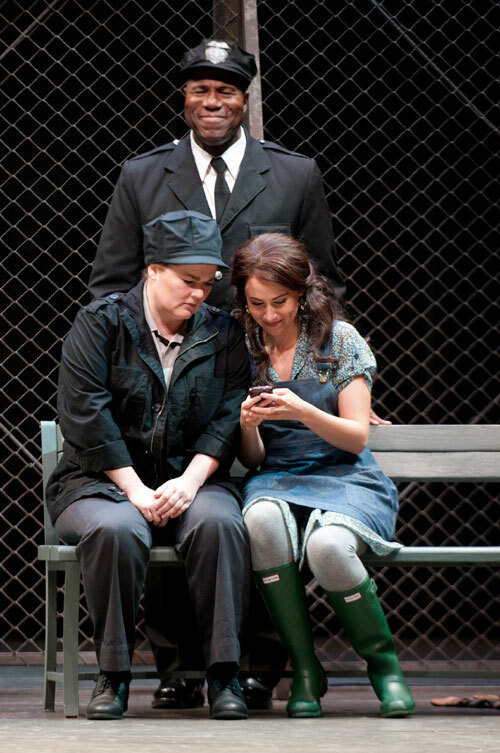 In October, he sang Rocco in Fidelio, and next month you can catch him as Colline in La bohème. But right now, he’s putting the finishing touches on his Alidoro in Cinderella, which opens this Saturday. In today’s artist Q&A, we chat with Woodley and ask him about his favorite moment of this classic story, and find out which fairy tales he grew up with himself. 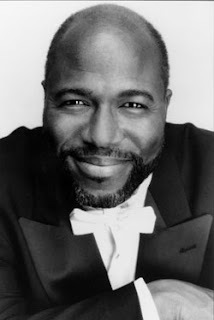 Recently, you mentioned to us the Anansi stories of your youth. Can you tell us about the origin of these stories? Well, they’re West African stories that were brought over by the slaves. Many times when the slaves were brought over, the first drop was in the West Indies, which is where both sides of my family are from, and where I spent my early childhood. Those stories were told from generation to generation through the slaves and the people who were brought there, and now there are actual books that have been written, that I’ve given to my own kids. We’ve kept a lot of those traditions going. First of all, they were like a form of entertainment for us all. When we got a little too frantic or whatever, one of the older kids or an adult would sit us down and tell us these stories. The smartest character was the spider, but lions, tigers, and all these animals of the jungle figured into it. And some animals that were not of the jungle, like the goat and the rabbit. And there was a lesson to be learned at the end of each fable, so we’d go, “Ohhh, so that’s how smart the spider was, and what he was really saying was that if you do this and this, then such and such will happen to you.” In essence, these were our fairy tales, and the fairy tales I first heard of. The Cinderellas, the Rapunzels, and all those other ones came later in my life. Arthur Woodley as Rocco in Fidelio, along with Marcy Stonikas (Fidelio) and Anya Matanovič (Marzelline). Speaking of Cinderella…what do you think the moral of the story is in Rossini’s version? That if you do good, good things can happen to you. If other characters learn this lesson, what lesson does Alidoro learn? Or is he just there to impart wisdom on others? He’s a wise man, yes, but I think when we’re talking about human beings, there’s always something to learn. I think the pleasure that he gets is watching what transpires with human beings, between human beings. So he’s always learning something new about each and every person. I think it’s when I truly open Cinderella’s—or, should I say, Angelina’s—eyes to possibility. She doesn’t have to be this girl amongst the rags, the ashes, the cinders. There’s another world, and I can help her get there, with her goodness, and my bit of magic or wisdom or whatever you want to call it. She can enter this world, and it will all be for her. That’s during my aria, “Là del ciel,” and it’s a wonderful moment. I’m telling her, “Look, this is what can happen to you. You’ll rise out of this mud, and the world will open up for you. There’s someone who is looking down on you and wishes you all the best in the world.” And then he says, “Wait a minute, I hear the carriage coming, I hear this is coming, and this beautiful dress is going to be yours, and you’re going to be so fantastic and gorgeous that everybody is going to love you.” That’s a wonderful thing to give to someone who has suffered most of her life. I really enjoy that. 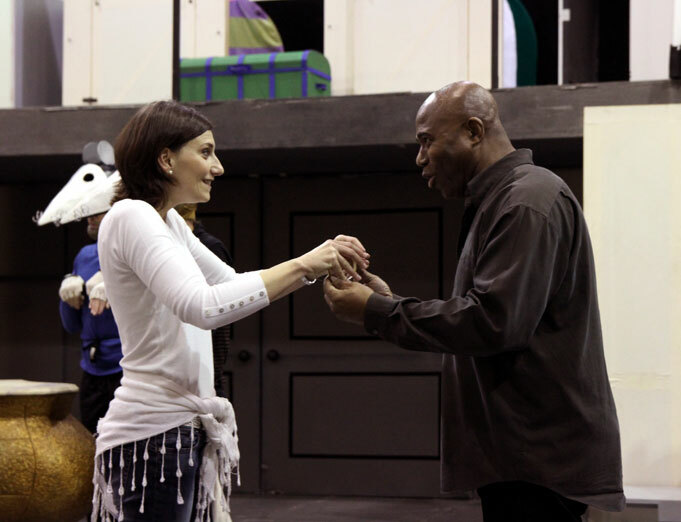 Daniela Pini (Angelina) and Arthur Woodley (Alidoro) in staging rehearsals for Cinderella. Is that aria as difficult as rumored? It’s a beast of an aria. It’s 18 pages long—and that’s a long sing! It’s very high, and up and down and all over the place. It’s a tough aria, but it’s also a wonderful aria in that it’s a challenge, and we artists want to be challenged. So I think it’s great. What I, as an artist, try to do is always to get to the bare bones of an aria. I want to get to what it’s all about. I want the audience to feel what I’m talking about. I want them to get it. So, in that sense, it makes it a little bit easier for me. 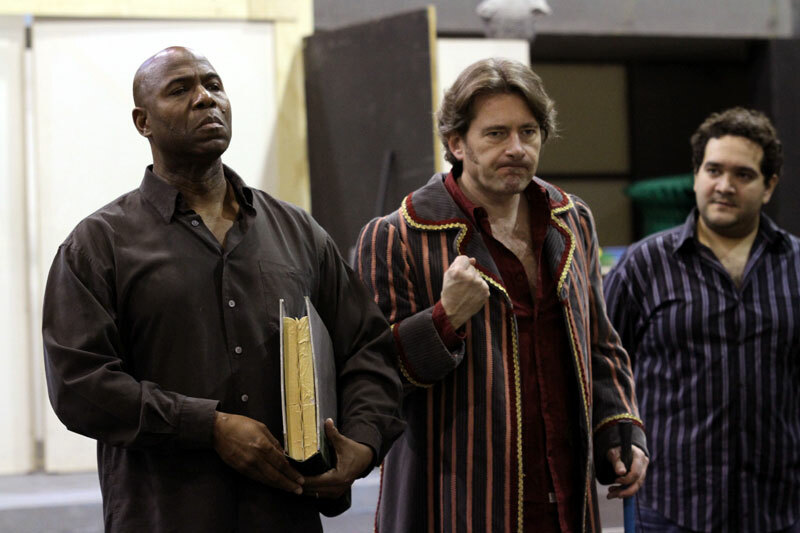 After Cinderella wraps up, you head right into working on La bohème. Are you going to have any downtime to relax? All work and no play makes Jack a dull boy—or would make Arthur a dull boy. So I’ll find time to go around and do little things. I like bookstores, things like that. And I love to read, so I will read, and also take some of those guilty pleasures like go to movies I haven’t seen. Arthur Woodley (Alidoro), Brett Polegato (Dandini), and René Barbera (Prince Ramiro) in staging rehearsals for Cinderella. A book called 1493 by Charles C. Mann. It’s a historical look at what happened after Columbus discovered the “New World,” and what transpired after that, after he came, and all the puritans and the pilgrims and all of them came. How that changed the world, and how it changed North America. You know, we didn’t have bumblebees and all these insects and all these things we’d never thought about before. And diseases that they had in Europe that weren’t among the natives here—even just a common cold. So it’s a pretty thick book, I’ll be reading that for a while.